MARK KRIKORIAN: Good morning, everybody. Thanks to those of you who swam here this morning. My name is Mark Krikorian. I’m executive director of the center. And this issue of asylum – people often call it political asylum, but in – you know, asylum is broader than just that – is an important one. I think even apart from the numbers, it’s especially important because it represents a kind of voluntary limitation on our sovereignty. In other words, that an illegal immigrant is – has a right, under treaty and under law, to apply for asylum, and if he qualifies under our rules, we have to let him stay, even though we didn’t agree to his arrival in the first place. It’s a – in principle, it’s a – it’s an important element of immigration law that’s different qualitatively from the other elements of it. And as far as the security aspects of asylum go, it’s – you know, it has real consequences. I mean, the Tsarnaev brothers, the whole family were asylum recipients. Just recently there was a Moroccan former foreign student turned illegal alien turned asylum seeker who was arrested for a terrorist plot. And even earlier, you know, Ramzi Yousef was an asylum applicant. The blind sheik was an asylum applicant. Mir Aimal Kansi, who was the CIA shooter over on 123 at that left turn to go into the CIA, where there’s still a monument for the two people he murdered – was an asylum – an illegal alien turned asylum applicant. So the consequences of asylum and how it’s managed are extremely important for immigration in general, and also, even more specifically, for security. And so to that end, we’ve brought this panel together. The news peg, as it were, is a paper we’ve published on the asylum issue by Dan Cadman, who will be the first speaker. He’s a longtime INS and then ICE official, a field agent, supervisor, a suit, was involved in most aspects of immigration enforcement – long experience and some deep knowledge on the issue. And then, commenting both on his paper and then more generally as well on the issue, are Michael Knowles, who is an asylum officer himself at USCIS, though not, obviously, speaking for the agency, and is also president of the union local – the card says he’s president of the entire American Federation of Government Employees, which is not the case – the president of the local here for USCIS officers. And he’ll be telling us some about what’s involved, what’s the work of an actual asylum officer in the real world, what kind of changes or resources or whatever might make that easier to do. And then last but not least, Jan Ting, who’s a professor at Temple, teaches immigration and tax law and various other things, is on the board of directors of CIS, but for the purposes of this panel, more importantly was involved in running – a political appointee in charge of asylum in the first Bush administration, Bush – George H.W. Bush administration – and has quite a bit to say, you know, from the sort of management end of how asylum works. So we’ll start with Dan and then Michael and then Jan and then we’ll have some discussion and Q-and-A after that. Dan? DAN CADMAN: Good morning. I’ll keep my remarks brief; mostly they’re kind of a précis of the article that was published by CIS. Asylum is the modern continuation of the age-old notion of sanctuary: providing safe harbor to those who would otherwise be persecuted by their fellow man. It is recognized by international law and treaty and, in the United States, through adoption of the relevant treaties and incorporation into our immigration laws. Asylum is only one of the forms of non-refoulement, or non-return, which our immigration laws recognize. Its major counterpart is refuge, or the granting of refugee status. Both forms of protection are considered a kind of extraordinary relief. This is evidenced in many ways, including the substantive differences in the manner of the adjudication as well as the forgiving of many grounds of inadmissibility that would render other aliens removable from the United States. People who ask for refugee status are outside of the United States. People who ask for asylum are either already in the U.S. or physically poised at its frontiers or ports of entry. The bases for seeking either refugee or asylee status are the same: having been persecuted or having a well-founded fear of persecution because of five designated grounds: race, religion, nationality, political opinion or membership in a particular social group. The latter two grounds – political opinion and membership in a social group – have undergone a gradual but constant evolution because they are not further defined. This has resulted in expansion of what constitutes a political opinion or a social group membership in ways to accommodate modern views of society – for instance, based on one’s sexual orientation – but also in ways most certainly never contemplated. Thus, the lack of definition constitutes a weak point in the asylum system through encouraging administrative and judicial constructions of those terms, sometimes to the detriment of society at large; for instance, by granting protection to former gang, cartel or cult members who purport to have changed their lives and views and are now being persecuted by those with whom they previously affiliated. Besides the physical location of the applicant, the other major difference between refuge and asylum is that refugee admissions are capped by law – which cap is set yearly. Asylum may be granted without numerical limit. This lack of a numerical limitation constitutes one of the weak points in the asylum system, in that it encourages individuals who might otherwise have no possible right or claim to enter the U.S. to attempt to game the system by fabricating stories of persecution which can be both hard to prove and hard to disprove. What is more, once having been in status for a single year as either a refugee or asylee, an alien may seek to adjust status to lawful permanent residence. These are powerful draws and there are many documented instances of successful use of fabrications to achieve refugee or asylee status which are only discovered after the fact. Just a few examples include the Tsarnaev family, of Boston Marathon bombing infamy; the recently arrested Moroccan El Mehdi Fathi, who planned to blow up a federal building and a university; even the maid whose alleged physical assault resulted in the arrest of Dominique Strauss-Kahn, former head of the IMF, against whom the charges fell apart when the evidence of her perjury on the asylum forms undercut her credibility as a victim and a complainant. Although a few anecdotes don’t make a solid case, these are not the only signs that fraud may be rampant in the asylum system. Studies by officials within U.S. Citizenship and Immigration Services point to extremely high fraud indicators in the files which they have examined. Unfortunately, the studies never saw the light of day until they were leaked a substantial amount of time after they were undertaken. Some of the ways in which past abuse has been curbed were through the institution of a careful regimen of barriers to the final achievement of asylum to discourage mala fide or frivolous cases. The barriers include detention of arriving applicants and threshold testing of an individual’s claim through a credible fear interview prior to formal adjudication of the application in chief. Many of those barriers have crumbled. Thus, the combination of expanding interpretations, the absence of numerical limits and the effective elimination of some of the safeguards against abuse have in recent years resulted in a quantum leap in the numbers of applications, numbers of those granted either temporary relief through a finding of credible fear, and numbers of those finally approved for asylum. For instance, positive, credible fear findings have jumped to 92 percent among cases decided on the merits. And, not surprisingly and almost certainly as a consequence, the number of claims has jumped almost 600 percent. Additionally, approval rates by asylum officers increased from 28 percent in 2007 to 46 percent in 2013. Within the immigration courts, even as findings of deportability by immigration judges have plunged in the past 20 years to an all-time low of about 50 percent of the cases that they hear, conversely, approval rates by immigration judges and affirmative asylum cases have increased from 51 percent in 2007 to 72 percent in 2012. This is deeply alarming when one considers that these cases heard by judges are those which were previously rejected and denied by asylum officers. Considered dispassionately, there is grave cause for concern. It would seem that the extraordinary nature of asylum relief has been forgotten, and it is increasingly being perceived by administrative bodies and courts charged with overseeing the system as just another immigration benefit. Worse, fraud, missed opportunities to implement detection and prevention mechanisms to deter abuse of the program, and ill-considered expansion of some of the definitions are contributing to a recognition that the asylum protections in the United States are being so egregiously abused and mishandled that steps must be taken. To do so, first the administration must reinstate rigor into the barriers against abuse. They were put there for a reason. Second, USCIS must institute both pre- and post-audits of asylum cases and, as a separate subcategory, credible fear cases on a routine and recurring basis. Third, Congress must reject the statutory amendments such as are embedded in the Gang of Eight omnibus bill, because they would aggravate, not ameliorate, the ills we are now seeing in the asylum system. And fourth and final, Congress should consider additional statutory reforms, including the possibility of extending the length of time before an alien may adjust to resident status after receiving asylee or refugee status, and perhaps through requiring a period of conditional residence before adjusting to full and final permanent residence. As you will hear, professor Ting has developed one line of thinking into how the program might be reformed. And although my own thoughts have wandered down different paths, I recognize there are many paths which can lead us to the proper end, which is a reform of an important form of protection that should itself be protected from abuse so that compassion fatigue does not set in, so that the confidence of the American people in the asylum system can be restored, and so that the United States can continue to be a safe haven for those legitimately in need. MR. KRIKORIAN: Thank you, Dan. Michael? MICHAEL KNOWLES: All right. As Mark graciously pointed out, I am not the national president of AFGE, which is – represents about 600,000 federal employees all over the United States and abroad, but I am the president of AFGE’s Local 1924 here in Washington, D.C., and we represent what we still call legacy INS employees who work in both USCIS and ICE in the national capital area as well as our field offices in the state of Virginia, several other remote locations, and at our consulates around the world. So all together, we represent about 2,000 immigration adjudicators, enforcement agents and various other folks who are really on the front lines doing this very awesome task. So I’m here not as a spokesperson for USCIS, although I am here with their permission, with the understanding that my comments would be, you know, on the record as Michael Knowles’ comments, and hopefully representing at least a sense of what the people that I represent, the workers, are feeling on the job. So I wanted to give just a little background of my own personal perspective. I started doing refugee work in 1975. I’m actually that old. I was 20 years old. I was a volunteer social worker in South Vietnam at the end of the war and I was one of 10,000 American citizens evacuated from Saigon just about 39 years ago, April 1975; and along with us, about 250,000 South Vietnamese citizens who were, you know, fleeing, you know, the unknown. That summer I wound up working in one of the large resettlement relocation centers in Indian Town Gap, Pennsylvania, and that began a long career with various nonprofits working under contract to the U.S. refugee program. Worked in the refugee processing camps all over Southeast Asia. I did some contracting for the United Nations and various international organizations doing studies not only about refugee protection, but also looking at how to help refugees return and rebuild their countries after the Cold War, you know, scenarios in Central America, Southeast Asia, Afghanistan. So I’ve looked at this from many different angles. In 1992 I was hired as one of the very first asylum officers in the new refugee corps that was established under Mr. Ting’s watch, and I remember very well he was one of the keynote speakers at our asylum officer training in Artesia, New Mexico, and it was a very, very exciting moment for us to embark on this adventure. So I’ve spent the last 22 years working as an asylum officer in Arlington, Virginia, and about 15 years ago took on the union role because I realized it was really important not only to be doing a good job as an immigration officer, but working to protect the rights and working conditions of the immigration workers themselves. They do an awesome job, whether it’s at the border, the ports of entry, detention centers, in our asylum program. These are very, very dedicated men and women who are very committed to their sometimes conflicting missions. It takes a big step back to look at the picture and really see – (chuckles) – how it all fits together, or at least is supposed to. Mr. Cadman raised many important issues. I don’t really intend to launch into a critique, pro or con, of his paper. I’ve read it. It merits a careful read by everybody. I haven’t read Mr. Ting’s pieces lately, but I look forward to reading them. These are all important issues that are raised in the debate, the great debate on immigration reform. And my only comment about immigration reform, not pro or con, is that we need it, and that I think our American history shows us that through debate, struggle, great ideas compete, and at the end of the day, the American people decide what our laws will be through our elected representatives. And I have great confidence, despite the turmoil around it, that we’re going to end up with the right fit. It may not be easy getting there, but hopefully our country is up to the task of getting through that debate. MR. KNOWLES: But specifically the increase at the border – I mean, of the APSO claims, the credible fear claims. And you know – you know, it’s a – it’s a very stressful job. The asylum corps is made up of quite a diverse group of people. Many, like myself, Mr. Ting and company, when they set us up actually went and recruited very heavily outside of INS to bring in people that had the kind of extensive experience that I have had over many years. And so that first class quite a cast of characters, many of whom have gone on to, you know, occupy important leadership positions in the immigration service today, one of them being our current Director of International Affairs and Refugees Joe Langlois. We – you know, I have to take one exception to a phrase I saw in the report about rubber stamping. We don’t rubber stamp – I don’t rubber stamp. I have seen rubber stamping, but that was about 30 years ago. I’ve had a front-row seat in this, working in refugee camps in Southeast Asia, when we didn’t have – it was before the Refugee Act of 1980 when the only real refugee program that the U.S. had was ad hoc. It was a, you know, act of Congress to say we’re going to give parole to X-hundred thousand Vietnamese, Soviet Jews, Nicaraguans, whatever group was viewed of national interest. We didn’t really have an asylum adjudication program. That was really rubber stamping. It was an important humanitarian program, but there was not a whole lot of case-by-case scrutiny. And I actually remember the day in January 1980, as a volunteer, presenting cases to – I think his name was Bobby Lee Cook (sp). He was a TDY INS officer. And we prepared all these forms, you know, just kind of – you know, these are refugees. And he rejected all of them because they didn’t articulate a well-founded fear of persecution. Of course no one had told us at the time that – you know, how they were going to implement this new law and what was it that these applicants were going to be told they had to articulate. So it’s been a long evolution from there to here. We give very, very intensive scrutiny to each case. I think I would like to say we’re probably one of the most rigorous vetting processes in the entire Immigration Service. And indeed, looking at our consular services abroad, we have an individualized personal interview with each applicant that lasts anywhere from an hour, or in cases of people like Michael Knowles maybe two or three hours. I personally checked, you know, eight to 10 different national criminal and security databases. They get fingerprinted, photographed, registered into the law enforcement and immigration system, which is also a significant side benefit of the asylum program where people are coming out of the shadows and getting registered into the system. And then I have to do a personalized written assessment of their claim, assessing their credibility, looking at the country conditions, applying the applicable law and making a very difficult decision, very subjective. There is a lot of fraud. There’s a lot of fraud in all immigration programs, and I think Mr. Cadman articulated many of the – you know, the potential pitfalls. But we – you know, I just have to speak again as an individual and for my colleagues. We take fraud very seriously. In fact, under our new performance work plans that were just issued, we were told that 60 percent of the weight of my performance review was going to be how well I did on fraud detection and national security. In my own asylum office, where we fluctuate between 30 to 40 officers in this office that’s responsible for the mid-Atlantic states, four of us are dedicated fraud detection and national security officers. That’s all they do, those four officers. And we are constantly flagging not only individual cases but bringing to their attention some of the patterns so that they can not only help us adjudicate the cases but feed that information back into what I think is a pretty robust fraud detection and national security unit, notwithstanding all of the challenges that Dan very carefully articulated. I would say one of the biggest challenges we face is the weight of the decision. It’s a very weighty decision because the consequences are dire. It’s not just someone might not get their green card. It’s someone might either get their green card or they might get returned to death or imprisonment. You’re not sure who’s telling the truth. There’s a lot of potential for human error, for gaming, whatever, but there’s also a lot of genuine asylum seekers. Again, as Mr. Cadman pointed out, our program exists for very important historical, ongoing humanitarian mandates. And one of the things that we’re tasked with is to make sure that that system, the integrity of the system, is maintained through vigilance. I described to somebody asking what we do that the Immigration Service is not supposed to be a wall; we’re supposed to be a screen, a screen through which people who deserve the right benefits are supposed to pass and against which we are supposed to bar those who don’t deserve the benefits or, worse, those who might wish to do us harm. Again, I would say asylum officers would welcome close attention to all of the areas that Dan pointed out. I think our biggest challenge, in addition to the weight of the case, is that we have tremendous pressure to make decisions and make them fairly quickly. Now, fairly quickly, I don’t mean two minutes at the consular window or at the immigration, you know, kiosk with the CBP inspector, but fairly quickly for us is, you know, within several days of the interview I have to deliver a decision. We have to – I think our mandate is that from application to decision delivery, we have about 60 days. That’s the target. That’s a lot of hands that that file has to get through. So a lot of people say, look, you know, the rest of immigration thinks we’ve got it easy because we’re doing two cases a day instead of, you know, 18 for a naturalization interview, but what we do is that much more complicated. We need some more time. We need more time to do these processes correctly. And we also need more staff. And we understand the asylum court’s in the process of – I think they’ve been approved to hire something like a hundred more asylum officers. So more time, more staff, more resources, and more public support and recognition for what we do. Mark reminded me of the time – and I’m just going to conclude by mentioning, in honor, two people that have inspired me, among many. One is Ms. Dani Agemovich (ph), who was my first boss in the refugee program in 1975. She was an aristocratic Yugoslav daughter of diplomats that were abroad in World War II and could not go back to communist Yugoslavia. She was a refugee – distinguished career in refugees and social work. She would interview the refugees decked out in, you know, old-world braid and earrings and linen gloves and pearl necklace. And she treated every applicant that sat in front of her – whether an admiral of the Vietnamese navy or illiterate fisherman – with supreme dignity and respect. And she said, you know, regardless of the merits, regardless of the outcome, whether they’re a good person or bad person, you have to maintain the dignity of that process lest our own humanity be pushed to the brink of the abyss. And that that is key to maintaining the integrity of what we do. The other individual was my nutrition professor at Rutgers named Hans Fisher. Dr. Fisher was a cutting-edge researcher on the importance of fruit and vegetable fibers in removing cholesterol from the digestive system. And he had a tremendous lecture on that. Dr. Fisher, as a teenager in 1939, was a passenger on the St. Louis, which was as ship full of refugees fleeing Germany. He was a German Jew. They were pushed away because they’d exceeded the quota for Jewish refugees from Germany that year. And that boat, as many of you know the story, went from port to port all over North America down to South America, back to Europe, and most of the passengers ended up disappearing in the Holocaust. But Dr. Fisher and his family got themselves on another boat, made their way to South America, back to the United States. But the wonder of his story was that this was really what our refugee program is all about is rescuing people from persecution, giving them a place to stand and an opportunity to contribute to make the United States the great country that it is. And I think if we can keep those things in perspective, it might help give us a little flashlight down this very difficult passage that we’re making. JAN TING: Well, thank you all very much. It’s really a pleasure to be part of this panel and to see my former colleagues Dan and Michael, who I haven’t seen in 20 years at least. So it’s great to be back with them again. I’ll just make a few points in response to what they’ve said, and the first point I want to make is that asylum law ought to be viewed in the context of our immigration system. 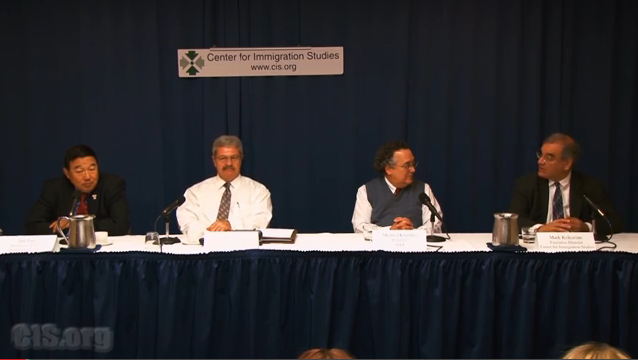 I think all of us on this panel understand that asylum law is part of our immigration system and has to be considered in that light. If the overall policy of our immigration system in the 21st century is to limit immigration to the United States, with asylum as an exception, that exception has to be viewed in the context of the overall policy. To my mind, asylum is not and should not be viewed, as some of my colleagues think, as a free-standing human rights law unrelated to and separate from U.S. immigration law and policy. It is part of our immigration system, as my colleague David Martin at the University of Virginia Law School has said, one of the few immigration law professors who has actually worked for the government. Asylum is a precious commodity that we ought to hold in reserve for the people who really need protection. And if we get careless in that, public support for asylum well and should diminish. And we actually see that phenomenon occurring all over the world now. Asylum is not a phenomenon limited to the United States but it’s under pressure and demand all over the world, and I think it’s losing political support as a result. And we run the risk, if we open the asylum window too wide, that it may not, in the future, be available for the people that we all agree need protection. And so we ought to be on guard with that concern. I want to say something about the credible fear standard, because I was at the INS at a time when the credible fear standard was fabricated out of thin air to deal with the phenomenon that large numbers of people were headed for the United States in boats and we needed a way to process them quickly. And as a short-term device that we thought would help us process them and help us repatriate and turn around the people who clearly did not have a case to come to the United States, the credible fear standard was created as an administrative measure to help turn around the obvious cases of ineligibility. That’s what it was invented for, and it is startling to me to see it in the statute of the United States now. I have no doubt that the members of Congress that put it in the statute intended that it be used in the same way, as a way to turn around people at our borders and at our airports who clearly did not have a case. And I think no one intended it to be used the way it’s being used now, as an affirmative way to get into the United States even though you don’t have a valid asylum claim; that you can come in and say, well, you know, I don’t have a valid asylum claim but I can meet the credible fear standard, right? I can put together a good story and then get in affirmatively. And I don’t think anyone intended that use for the credible fear standard. I think the credible fear standard had a use at its time. I think it’s outlived its usefulness, in part because it’s so easily gamed. People can come up with stories that they know are going to work. And so I think we need to reconsider whether the credible fear standard has outlived its usefulness, whether it causes actually more harm to our system than benefit. And as Dan mentioned, I gave testimony to the House Judiciary Committee in December in which – you know, I’m an academic so we have the luxury of looking at the big picture. While I applaud many of the proposals Dan has raised in his paper, you know, the bigger concern is to me, has the asylum standard outlived its usefulness? We only had asylum in the United States since 1980. How did we fulfill our international obligations to protection before 1980? Oh, well, we had withholding of deportation prior to 1980, and we still have it in the form of withholding of removal now in what is it, 241(b)(3)? And that’s still on the books. I think asylum was a good idea in 1980, but I don’t think anyone envisioned the current situation that we’re facing with the enormous numbers of people claiming asylum, the way that asylum, like credible fear, has been gamed and people have fabricated stories that they think will work, and thanks to the Internet are easily spread and propagated. So I think we need to think about whether the whole notion of asylum, which is under attack worldwide, I would – as I said earlier, not a phenomenon limited the United States – whether that has outlived its usefulness, and if so, what alternatives are there? Well, we still have withholding of removal on the books. And people say, well, that’s not as good as asylum. It doesn’t provide following to join for family members. It doesn’t provide adjustment of status. Well, you know what? We could add those. We could improve withholding of removal by adding following to join for family members. We could add adjustment of status under specified conditions to that. And, you know, I like Dan’s idea of adding a conditional period, a conditional green card. We give a conditional green card to spouses of U.S. citizens, right? We give a conditional green card to investors in the United States where we say, we’re not going to give you a green card right off the bat. We’re going to give you a conditional green card for a couple of years, see how you do, and we’ll make it permanent at the end of a certain period. Well, if we’re going to do that for spouses of U.S. citizens, why wouldn’t we do that for asylees, to say, yeah, you know, you can – you can adjust status after a certain interval of time but we’re going to make your green card conditional, just like we do for spouses of U.S. citizens. And then, you know, we’ll give you a permanent green card a little further down the line than we do now. But I think – I think the whole notion of switching from Section 208 asylum to Section 241(b)(3) is something that we ought to consider. I think the Supreme Court has made clear that there’s a higher threshold for withholding of removal than there is for asylum, and I think that would, without a doubt, limit incidents of fraud and questionable asylum claims. Just two more points that I’ll close with: We often hear about the importance of border security. And I don’t think anyone doubts the importance of border security, but I think we have to be under no illusion that border security is by itself a solution for all the challenges our immigration system faces. You know, people tend to say, oh – you know, to whatever immigration reform proposal they say, and we’ll strengthen the border, right? That’ll fix all the problems going into the future. Well, I just want to say no, it won’t. Border security by itself cannot fix our immigration system. And the reason everyone talks about border security is because there’s no constituency opposed to border security, right? Any other immigration law you’re proposing change, someone is going to fight you on it. But on border security, yeah, no one is really opposed to more border security, even at the spending of tons of money. But the reality is border security isn’t going to solve the problem as long as the demand for immigration so dramatically exceeds our willingness to take legal immigrants into the United States. And so if we really want to limit immigration to the United States, we need to deter the demand. We have to alter the cost/benefit analysis that people go through when they try to come to the United States in violation of our laws. One of my colleagues at Temple used to say, the poor people of the world may be poor but they are not stupid. They are as capable of doing cost/benefit analysis to determine their own self-interest as anyone in this room, and they do it all the time. And, you know, if people are doing a cost/benefit analysis to decide whether to come to the United States in violation of our laws, they say, well, what are the – what are the benefits? Well, if you get in, you know, you have a lot better life, but if you – you also run costs. You might get caught. It’s expensive. You have to pay smugglers. It’s dangerous. And so they engage in that process. And if we want more illegal immigration we increase the benefits and lower the costs. You’ll get more. If you want less illegal immigration you have to lower the benefits and increase the costs. You’ll get less. And I think we need to recognize that if we’re looking at a long-term fix on our immigration system, we have to alter that cost/benefit analysis. And, you know, fundamentally if we’re trying to go to the most basic question in immigration law, it comes down to a binary choice: Do we want to limit immigration to the United States or not? That’s a yes-or-no question. Either we’re willing to say unlimited immigration to the United States is fine, or unlimited immigration to the United States is not fine. And we have to have some sort of numerical limitation that we’re willing to take, and we’re willing to turn away people who look like our own ancestors simply because we have a numeric limitation. Take your choice, right? One or the other. And I think our dilemma in the United States over immigration is based on our inability to make that basic choice. And in effect, too many people, including many in government, are saying give me a third choice, right? I don’t like either of those choices. I don’t like having unlimited immigration and I don’t like having to enforce a limit either. Give me a third choice. Well, I think there isn’t a third choice, right? That’s the big secret, and we have to make that hard choice and that’s part of our problem. You know, the situation at the border, some of us – the last point I’ll make is that some of us remember that famous “60 Minutes” report at Kennedy Airport which was made in the early 1990s that showed people were just walking into the United States after landing without documents at the airport. And I think we need – I don’t know if any of you are from CBS News, but we need “60 Minutes” to go out and do a – do a report at our southern border, showing what’s happening there, that people are coming in, making a credible fear claim and walking into the United States without documents, without any assurance that they’re going to show up for their hearing. I think that would be as sensational a report as the “60 Minutes” piece was 20 years ago. Thank you very much. MR. KRIKORIAN: Thank you, Jan. Since I paid for the mics I want to ask the first question, and this would apply to anybody. I’d love to hear anybody’s reaction because this is not something we brought up. This relates mainly to affirmative asylum claims, and this is the issue of safe third country. I mean, it seems to me that no one who has arrived from the Frankfurt Airport or Heathrow or Paris, or frankly Mexico, should even be permitted to make an asylum claim because they should have made the claim in the country they passed through beforehand. And we have a very – I mean, we have a safe third country agreement, sort of, with Canada, which is fine and I guess it’s a place to start, but it seems to me that there’s – as far as affirmative claims from people arriving at the United States, I’m not sure there’s anyplace other than maybe somebody who came from Haiti directly on a boat who could – who has any grounds to even make an asylum claim since they should have done so in Germany or in Spain or in Mexico or in Japan. And I just wanted to get people’s reaction to that. Anybody have any thoughts? MR. TING: Well, I’d be interested in Michael’s view as somebody who’s on the front lines, but I will say it seems to many observers that there has been a willful willingness on the part of the government to overlook statutory requirements. One of the statutory requirements is that people making asylum claims at port of entry should be detained until their asylum claim is adjudicated. That is not – even though it’s in the laws of the United States, that is not being complied with. So I don’t think it’s a surprise to anyone that, yeah, the laws of the United States do provide that people who come through a safe third country should not be eligible to make asylum claims. It doesn’t shock the conscience that, oh, that’s not being observed either. And, you know, the reality is we could, even in the absence of a third-party agreement, put people back on the airplane. But often, you know, it takes so long to adjudicate the case that the practicality of that remains to be seen. I will note that this is an issue within the EU also. Even within the EU they’re fighting over where asylum claims should be made and trying to enforce the rule that you can’t pass through a safe country on your way to your country of choice to make your asylum claim. I think if we, as a government, wanted to take a stand on that issue, the legal apparatus is in place for doing so. You know, I take Michael’s point to heart that we – there is a democratic process at work in this country which determines our laws, and our laws that are in place today have been developed through that democratic process and are entitled to respect. If Congress wants to change it, they can change it, but until they change it the laws of the United States are the laws of the United States and ought to be respected as the product of our democratic process. MR. CADMAN: I agree with that. And in furtherance of the notion of resettlement, it smacks of a kind of selectivity on the part of the person who is allegedly in flight that – it seems to me in contradiction to the notion that they are in fact fleeing from oppression if they pick and choose where they want to land. It seems to me that if there is truly a danger to the person and to the person’s family, that they will land where they need to, to gain succor. Later they can give thought to immigrating through the other available legal means to get where they want to go, but if they are truly fleeing persecution, then being picky-choosy kind of flies in that notion, to my way of thinking. And the corollary that bothers me a great deal is that once someone has gained refugee or asylee status, there seems to be an overlooking of the fact that many of them find their way back to the country from which they were claiming persecution. There’s a stamp in the passport when they arrive at the port of entry. Either out of indifference or ignorance or deliberation, CBP officers as inspectors don’t say: Wait a minute. Explain this to me. How is it, Mr. Tsarnaev, that you went back to the place that you claimed, you know, to be fleeing from? How does that work for you? I find that is the kind of thing that casts ill repute on all of the associated refugee asylee withholding programs in their entirety. And I think in the end it will not redound to the benefit of an honest, robust program that the United States can be proud of. MR. KRIKORIAN: Michael, do you have any thoughts on the safe third country idea? MR. KNOWLES: Well, I’m reminded of Professor Fisher and the St. Louis. MR. KNOWLES: And just to finish the thought, you could say that was 70 years ago and the world has changed, but one of the ways the world has changed is that we now do have an international protection system. But in order to keep it going, keep it alive and keep it robust, it’s going to require a lot of work. And I think that’s what we’re talking about now is to make sure that system does what it’s supposed to do, and in order for there to be safe third country mechanisms it will require a lot of cooperation with those partners. But simply for one country to unilaterally act apart from those partnerships is a perilous route to take. MR. CADMAN: I was going to say there was an interesting article in the most recent version of the New York Review of Books, and it’s about Franklin Roosevelt and whether he was anti-Semitic or, at minimum, not sufficiently attuned to the plight of European Jews. And it speaks at some level of detail to the St. Louis, and I was surprised that the – that the facts that are laid out about the St. Louis are not precisely the same as the myth that you and I have heard with some frequency. So I would encourage you to go back and read that article. MR. KRIKORIAN: – but I would only add before I open it to questions is that the – you know, the issue – I mean, what we’re talking about is somebody who’s, let’s say, from West Africa. You know, they end up in – first of all they travel to several countries in West Africa then end up in France, then get on an airport – on a plane in France and move here, I see no moral justification, literally, for granting – even considering asylum application from somebody like that, because they had an obligation, if they were genuinely fearing for their lives or liberties, to apply for asylum in France. I mean, I’m not even arguing the – sort of the mechanics or the legal tools. I’m saying, even the very principle of asylum seems, to me, illegitimate for somebody in that situation. MR. TING : And I just have one more comment in response to that. The – that is the European view, I think, that asylum should be claimed in the country – first safe country that you come to. And they’re trying to persuade the Italians of that – (laughter) – and the Italians are resisting, saying, no, everyone comes to Italy first; they shouldn’t have to make their claim in Italy. MR. KRIKORIAN: Or the Maltese, yeah. MR. TING: We don’t want to handle all these – handle all these asylum claims. But increasingly, that is the European view. And indeed, in the United States, our statute does engage in wishful thinking in providing for multilateral agreements and saying that, oh, if you can sign an agreement with some third country, then we can send people back to wherever they originated in. And as Mark says, we’ve only been able to sign such an agreement with one country, Canada, and that took years and years and years of negotiation, so we finally have an agreement with Canada. So if somebody flies into the United States from Canada and says they want to claim asylum, we can say, no, you just flew in from Toronto. Go back to Toronto and make your claim there. And of course, the Canadians can do the same thing if people fly in. MR. CADMAN: And I would note that numerically, the country of those two countries that is getting the largest number of people arriving at their shores is the United States. MR. TING: Is the United States. MR. KRIKORIAN: Is not Canada. MR.CADMAN : So Canada gains the benefit of that lopsided negotiation. MR. TING: Which is also why European countries have been unwilling to sign such an agreement with the United States. There aren’t a whole lot of people flying from the United States to Western Europe to claim asylum, and the Europeans know that. But, you know, hope springs eternal, and we still have that language in our statute. So if anyone wants to sign an agreement with us, the United States is anxious to do so. MR. KRIKORIAN: OK, let me open it if anybody has any questions. Yes, and then you, yeah. Go ahead, in the back. MR. KNOWLES: Could I know who you are? Q: Yeah, I’m Julie Axelrod from the Federation of American Immigration Reform. MR. KNOWLES: You can ask for – we can and do ask people for documents. I mean, first of all, we ask to establish their identity, which is really key to the whole process. And then of course we ask, do you have any documents to substantiate your claim, which, depending on what it is, you can ask for different documents. But you have to also – I mean, this is our training and our experience as an asylum officer – take into account that – well-established in international law – sometimes people who are in flight must resort to obtaining fraudulent documents simply to obtain a foothold somewhere else. So you have to sift through that whole thing. I mean, you could have a truly legitimate refugee who obtained a false passport, false identity, simply to get out of the country that was seeking their demise. And the classic example would be the famous Swedish diplomat Raoul Wallenberg, who, you know, in the last years of World War II, issued something like 70,000 – sorry, Swedish passports to Hungarian Jews to protect them from deportation. So we have in our training and our matrix of what we have to look at the question of materiality. What is the material relationship of the document to true identity, true story and so on? Someone might have used a fraudulent document, but their telling of that story, if credible, could lend credence to their claim. On the other hand, sometimes we ask for documents, and you know what, people go get any document they want. If you ask for it, if you make that the standard, then go get them, right? (Laughter.) It might be a real document; it might not be a real document. And so we are challenged constantly with that. We’ve got, you know, a robust relationship with our forensic document labs and our fraud people, but there’s always ultimately that human transaction that has to take place where you have to make a difficult credibility call looking at the totality of the circumstances. It’s not an easy answer. MR. CADMAN: I don’t – no, it isn’t, and I don’t suggest that – I don’t suggest that there is an easy answer, but I would also note that when Michael talks about the value of, you know, fingerprinting, photographing and registering, which is of course a part of the asylum or refugee process, the downside is that because you’re dealing with at-risk populations in unsettled, you know, areas of the world, you may sometimes accord someone a registry under a completely fictitious identity and thus create for them the identity that they want created, and it’s difficult to know that you’ve done that unless something horrible and untoward happens. So registry has its good side, but registry also helps embed someone in a system in a way that creates an identity for them that they may not have had previously. MR. TING: When Michael and I were working together to set up the asylum officer corps back in the early ’90s, the State Department was involved in the process of considering asylum claims. That is no longer the case now, as I understand it. And I think the State Department welcomes that. They did not want to have any responsibility for asylum claims on their plate. But one of the suggestions I made in my testimony to the House Judiciary Committee in December was that, you know, some sort of role for the State Department should be carved out in the asylum process. They should have the opportunity to weigh in on cases that they choose to weigh in. I – you know, I wouldn’t make it an obligation on their part, knowing that they’re not anxious to take on this responsibility. But they should have the opportunity to weigh in. I mean, the reality is we have trained foreign service officers all over the world who speak the language, who live in the country, who can, if they choose to, look at the asylum claims that are being made and express an opinion, yeah, this sounds right, or this doesn’t sound right; there’s something wrong with this claim, or we’ve seen this claim before all the time; this is a common story that’s told in wherever. And I think, you know, one of the short-term modifications we might consider is providing a role, an opportunity, if you will, for the foreign service officers, who we trust to represent our interests all over the world, to weigh in, if they choose, on asylum claims. Q: I’m Jack Martin (sp), and I’m one of those State Department people who had a role in providing advisory opinions on asylum claims at one point in time. And I certainly would agree with Professor Ting that it would be a very worthwhile role for the State Department to resume. But my question basically is would you care to comment on the growing split between entry into the refugee program, as opposed to asylum? The reason for that question is that there – that both programs are based upon the same definition, basically, and the asylum policy was set up simply to deal with people who were already in the country that basically met the same definitions as somebody who would be eligible for the asylum (sic) program, but because of actions both by Congress and by our court system, a growing divergence has evolved between the two programs. Examples of the congressional actions are the Cuban adjustment program, treating all Cubans as if they were refugees, even though everybody knows that that’s not the case; the one child family planning policy of China incorporated as law, giving those people a claim to asylum in the United States, which is not a part of the international practice of the U.N. High Commissioner on Refugees. Examples on the court systems is the granting family abuse entry into the United States, asylum protections that are not part of the international system. It seems to me that all of those areas in which there’s a divergence between the international standard and the – and national practice are areas that really merit close look in terms of any sort of reform. MR. CADMAN: I tend to agree with you. And Professor Ting spoke earlier about cost-benefit analysis, and quite frankly, if I was an alien and I had any opportunity to land my feet at a port of entry, whether it was, you know, air, sea, you name it, I would prefer to apply for asylum, not refugee status. You know, you’re in a – you’re – likely, in a refugee camp, you’re going to have to wait for UNHCR or one of its contract agencies to assist you. You’re going to have to wait to be funneled to this country or that country for an interview. You’re going to face a cap, whereas none of that applies if you can show up at port of entry, or even if you cross surreptitiously through the southern border, and you’re here, and you can make your claim within on year’s time, it’s much to your advantage to do that. So in a certain sense, that divergence has acted as a magnet. MR. TING: The big difference between our overseas refugee program and our asylum program, even though they meet the nominal same standard, is that the United States has never represented our willingness to take everyone who meets the – even the international standard in the overseas refugee program. Our position has always been we’ll take our fair share of the people who meet that standard and – as opposed to the asylum program, where we basically represent everyone who meets the international standard as in an expansive way, as you’ve outlined, even beyond the international standard, they will qualify for asylum. They will qualify for discretionary asylum, 100 percent of them. And so that’s the big difference between the two programs. MR. KRIKORIAN: Do you have any – (inaudible)? MR. KNOWLES: Well, only – I mean, this is really not a comment on quotas or whatnot, but by signing the Refugee Convention, what distinguishes the two is that when someone lands on our shore and makes an application, we are obligated by that convention to give them a due process, to hear their claim and not arbitrarily return them to, you know, their possible risk, which is very different than, as you said, going to a refugee camp, where we have no sovereignty and it’s really an international partnership to – you know, to take one’s fair share, which is really only a drop in the bucket. We’re looking at, you know, 20 million – I think the current average is 20 million refugees in camps, warehoused all over the world, and the United States and its partners only take a very small portion of those. But it’s fundamentally different when they arrive on our shores and then – we then have a treaty obligation. Q: I have a question for Mr. Knowles and that maybe one of you can comment on as well. MR. : And you are? Q: I’m sorry. I’m Marguerite Telford. I work for the Center for Immigration Studies. MR. : Oh, I’m sorry. Yeah. Go on. The fraud rate is high. The fraud rate is extremely high. And it seems from your talking, you have total trust in the integrity of the system, and you feel like the workers are very vigilant, and the only thing you really talk about is you need more time. If time would actually allow us to rectify the problem, if that’s all that takes, it’s not a policy problem or anything else, and it’s only because of time, how do the people you represent feel about how the credible fear policy is being used? I mean, if they actually use that as a way to cut off all those that are coming through, instead of having what, some 92 percent, I think it was, acceptance rate on the incredible fear now, how that can be done differently to help you find the time you need? MR. KRIKORIAN: Well, pick one of them. MR. KRIKORIAN: I mean, go ahead, because we want to wrap up. MR. KNOWLES: Well, first of all, I don’t subscribe to total trust in the system; that the system is a system; you know, that to make the system work is coming to work every day and all of us working together to make it work. And it’s always going to be imperfect, it’s always going to be gamed, and it’s always going to require vigilance to make sure, as I said, the screen is operating. But it’s never going to be failsafe. All I was saying is we have probably one of the most robust processes in the immigration system. Is it gamed? Yeah. Is it fraught with, you know, potential loopholes that someone might exploit? Yes. That’s why they have us doing this job. And it requires tremendous amount of cooperation between agencies – state, local, international – to make it work, and it will never work perfectly. So that's the first thing. Q: But if you had time, what impact would that have on that fraud rate? MR. KNOWLES: – and that means – and that really means more people. Q: Application – fraudulent application. MR. KNOWLES: Well, what is – I mean, then you have to get into what is a fraudulent application. So my – you know, what I said earlier about, you know, a real refugee might commit fraud in order to save themself. So you have to – you have to, you know, get down deeper in the weeds to say, is it fraud that goes to the materiality of their claim? Is it fraud that underscores that they’ve gamed the system and it’s a frivolous claim? You have to – you have to get down in the weeds on each case. So more time, yeah, would help. More people doing the work would help, and better cooperation between the different entities who do this would help. But is there an ultimate fix? I don’t think there is. MR. KNOWLES: That’s for the credible fear, right. Q: – for the credible fear – I mean, that’s an increase over the years, right? MR. KNOWLES: You know, I am – I am not watching the statistics of the program like others, but I think there’s some confusion in the debate about the credible fear program and the affirmative asylum program. They’re really not the same. And I think our partners on the panel – Mr. Cadman’s paper explains those differences. Mr. Ting does. But I think in the – you know, in a short discourse like this, sometimes the distinction is not there. So if you see – I mean, I have personally not done credible fear interviews on – you know, since they were instituted in the ’90s, just because I’m doing a lot of other asylum work or union work, but the process is very similar. The intent, as Mr. Ting talked about, was to try to streamline a process so that you could get people who had a possible claim in front of the appropriate adjudicating authority, which the law says is the court, so that, you know, we could get in – it’s basically a screening process. We’re not granting asylum to people through credible fear; they’re not granted asylum, they’re granted an opportunity to get their case heard in court. And so, yeah, there is a – I wouldn’t say there’s pressure for us to approve everybody, but there’s pressure placed on us by the volume – and you’ve talked about some of the different reasons for the volume. There’s also the reason that you look at the papers every day and see what’s driving people away from their countries. It’s a complicated mix here, but we’re not just rubberstamping people to give them asylum, we’re trying to move them quickly, those who might have a claim to get in front of the judge. Then you get into all the questions of detention policy: should they be detained? Should they be released? That’s way beyond, I think, the scope of, you know, what I – what I’m really capable of addressing. But as far as your initial question about fraud rate, I can’t control the fact that people might commit fraud, but I am tasked with the very difficult job of trying to figure out when it happens, why it happens, how does it apply to the case in front of me, and what can we do about it. But if anybody said I’m turning a blind eye or any of my colleagues are turning a blind eye or even if our – anyone was to say our authorities were telling us to turn a blind eye, I would – I would object to that. MR. CADMAN: My concern is that it’s – that the – because there are so many discrete places and portions of this system, which should be considered holistically as a find – you know, as a – like a clock mechanism that all the gears have to work well together that if each is handled discretely, but differently, the clock doesn’t work. And I think that’s what happening. And my other concern is that, yes, it’s true that credible fear is a different thing that actually making the decision on the asylum, but the one drives the other. If credible fear begins to be looked at as something that you can give it because later somebody else has to make the final decision, and in the meantime, you can get the – forgive me, but you can get the paperwork off your desk and maybe even sidestep that hard decision about I could send you back to your death, you know, maybe it is easier sometimes to say I’m going to pass you on credible fear so that the IJ can make that tough decision. Is that at work? I don’t know. What I do know statistically is that the – there is a – there is something at play that wasn’t there before, both in terms of numbers and in terms of statistics, showing what’s being passed as approved, whether it’s for that moment of the credible fear or the affirmative claim in front of an asylum officer, in front of an immigration judge, whatever. And it does smack back to the days that Jan spoke of when people would get on a flight – you know, an Air France flight, land at JFK, they flush their documents down the toilet in the meantime, they get off, they say I want asylum. And at that point in time, because there was no credible fear, there was no mandatory detention, they would walk through the international area and be paroled out the door and await a hearing that would be many, many, many, many months up the road. And that certainly is a commonality with what goes on now. MR. KRIKORIAN: (Off mic) – work permit? MR. CADMAN: I beg your pardon? MR. KRIKORIAN: With a work permit. MR. KRIKORIAN: No, no. Go ahead. Finish what you were saying. MR. CADMAN: I’m – but – I’m done. MR. TING: Yeah, back in the day, of course, they didn’t even have the 180-day requirement. They just got the work permit right away. I just wanted to say, you know, when I got out and speak – which I do less and less – the – I often hear from asylum officers, former and present, and they say pretty much what Michael says. You know, they feel very much under pressure to move the caseload along, and they’re being evaluated on processing – how quickly they can process the cases. And, you know, they make the connection and they say sometimes they would like to take more time on a case. If they see – they have concerns about fraud, they would like to peruse them, but they’re under pressure. Move the case along. You know, they’re being evaluated on how many cases they can – they can clear. And, you know, they wish they had more time to pursue concerns about fraud, and they don’t have enough time. And I think – you know, that strikes me, based on my anecdotal conversations with people, to be a common concern that – and maybe it’s always been there. Maybe it was there from the old days too, the need to move the cases along. I know we had a big backlog in the early days that we were trying to clear out, too. So maybe that’s always been there. But I – that is – it seems to me a contributing factor to the incidents of fraud in the system. MR. KNOWLES: – that I think is often a misconception about the rubber stamp, you know, thought. There’s a perception that, you know, we’re under pressure to decide a certain way, and that’s always a struggle, you know, that’s – and human error. I have found, however, that it’s usually more at the supervisory level. I might have a disagreement with my supervisor about a case, and I usually – you know, I take great pride in the decisions that I make. And I’ve said for 22 years the day that I’m told how many I may or may not approve or deny arbitrarily is the day I resign. I’ve been given great training, they hired me because of my skills and given a great deal of discretion. We do have 100 percent supervisory review of our caseload, which is unlike any other process, to make sure that we’re doing it correctly administratively. But ultimately, if we had done it administratively correctly, we’ve done our security checks, it’s a legally sufficient decision, the discretion is usually respective of the officer. And sometimes, there’s a healthy debate, but I can say I’ve never been ordered to change my decision, you know, up or down. I’ve had those robust debates and it’s always one that I think – those debates keep our system healthy. MR. KRIKORIAN: OK. Well, thanks. I want to – we could keep talking about this for a long time, but I want to respect people’s time.